Last Wednesday I ran through the late afternoon downpour towards the McGill metro station, a minor river coursing down each sidestreet. I was thinking about what I’d make for dinner when I got back to my apartment, and the idea of running into one of the most deadly creatures that ever walked the planet was the last thing on my mind. I had cleverly neglected to bring an umbrella or a jacket, and the sky had really opened up. By the time I reached the doors of McGill station I could have wringed out my sweater. Slopping down the stairs, I entered the hallway, turning past scotiabank where a young woman was taking money out of the ATM. “I saw her on Mac campus last week,” I thought as I rounded the corner toward the turnstiles. I could hear some commotion up ahead, but thought nothing of it. “Probably a bunch of teenagers,” my mind subconsciously registered. Then I saw something moving on both sides of one of the support columns. That was a bit odd, since the columns are at least 6 feet wide. I saw a flash of a tail. Then some scales. 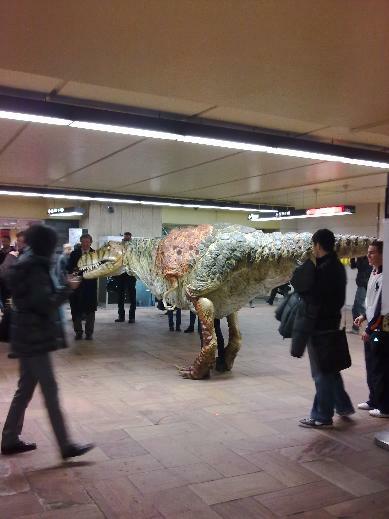 All of a sudden, a dinosaur lumbered into sight. It stared at me, wide-eyed, and then blinked slowly. 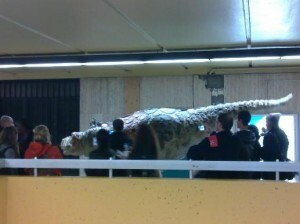 It was a mid-size theropod, probably about seven feet tall at the shoulder and about 20 feet long. These animals, in the same suborder as T-Rex (I apologize for being a biologist) had diminished forelimbs and an enormous carnivorous appetite.. Although this one was a lot smaller than its cousin, it still looked pretty cramped in the metro station as it trudged towards me. 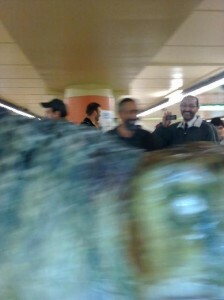 Slowing and extending its neck, the dinosaur audibly sniffed my hand. Then it cocked its head to the side and suddenly SNAPPED its huge teeth at my fingers with a growl. I pulled my hand back quickly and it walked by, stomping across the tiled floor, waving its huge tail side to side behind it. The guy controlling the puppet was incredible. He actually acted like a dinosaur. He blinked the eyes, and swung the long neck around purposefully, surveying its surroundings skeptically. The movements were unpredictable, erratic as you’d expect from a wild animal finding itself in unfamiliar surroundings, and surrounded by food! You could hear it breathing, and it audibly growled at key moments. It was definitely the greatest thing I’ve seen in the metro. The feeling afterwards was strange; even though I knew right away it couldn’t be a dinosaur, it had really got me. I mean, I love Jurassic Park. You could see the people in the station were feeling the same mix of interest and excitement; their bodies all the while telling them ‘danger, danger! Look at those teeth’! 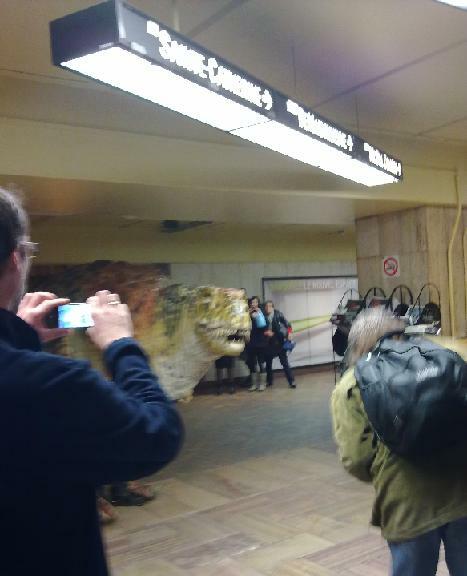 The whole thing turned out to be a publicity stunt for the Dinosaurs Unearthed exhibit down at the Montreal Science Centre, which apparently features a bunch of giant, animatronic dinosaurs. To the organizers: that was awesome, do it again, and if possible bring Jeff Goldblum, in character. Chaos. Published by erik on 2011/10/22 at 9:05 PM under General Discussions. If I wasn’t studying bugs, I’d be studying dinosaurs. I spent quite a few months working in the dino gallery at the Canadian Museum of Nature and fell in love with them then. I would pay money to get the chance to be the puppeteer in that getup. Oh my gosh! I can’t believe I missed that!